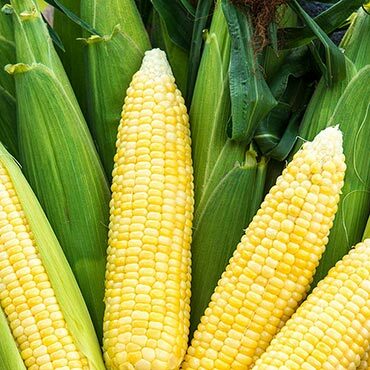 This sweet, flavorful variety of corn is known for its exceptionally tender kernels, which are packed in 18 full rows on every 8" ear of corn. They're great for canning and freezing, and will bring a crisp crunch to salads, side dishes, and more. As dependable as it is delicious, Bodacious has excellent disease resistance to common corn diseases such as Maize Dwarf Mosaic Virus and rust fungi. Our Bull's-Eye™ Bioinsecticide can be used to deter any pests. Plus, Bodacious seeds are treated so that they'll germinate faster and healthier, reduce the need for sprays, and produce a higher yield. Spacing: 10-12" plant spacing. 36" row spacing. Plant in blocks of at least 4 rows for adequate pollination. Spread: 1 - 1 1/2 feet. Fruit: Yellow corn. 8" ear length. 1.8" ear diameter. 16 rows of kernels. Pruning: Not necessary to remove suckers (side sprouts growing from the base of the plant). Seed Count: Packet has approximately 250 seeds, 1/2lb has approximately 960 seeds, 2 lbs has approximately 3,840 seeds.